Throughout Barack Obama's presidency, he has experienced highs and lows. While President Obama's popularity has fluctuated, the popularity of Michelle Obama has remained high. She has received comparions to the late First Lady, Jackie Kennedy. Even members of other political parties love Michelle Obama. 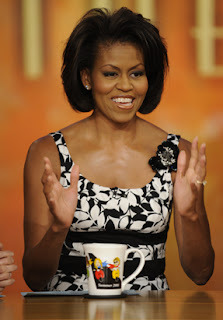 The first African-American First Lady in American history, Obama has made her mark with the children. She has proven to be an excellent mother to her own children. While raising two well-mannered daughters, she has been a positive role model to the children across the world. Recently, Michelle Obama partnered with Beyonce in order to help out with getting the children active. Over the past decade, or more, children in the United States have been less active and more sedentary. For years, the government has been trying to make the children more active. In 2009, Michelle Obama began working with several children exercise programs in order to get the children active. Now, Michelle Obama is trying her hand at writing. Currently, the First Lady is writing a book about what she knows. She is not going in-depth about President Obama or politics. Instead, the book will be about her passions, gardening. The book will have ghostwriters helping her put it together. The release of this book will not come until April 2012 and all profits made will end up going to charity.